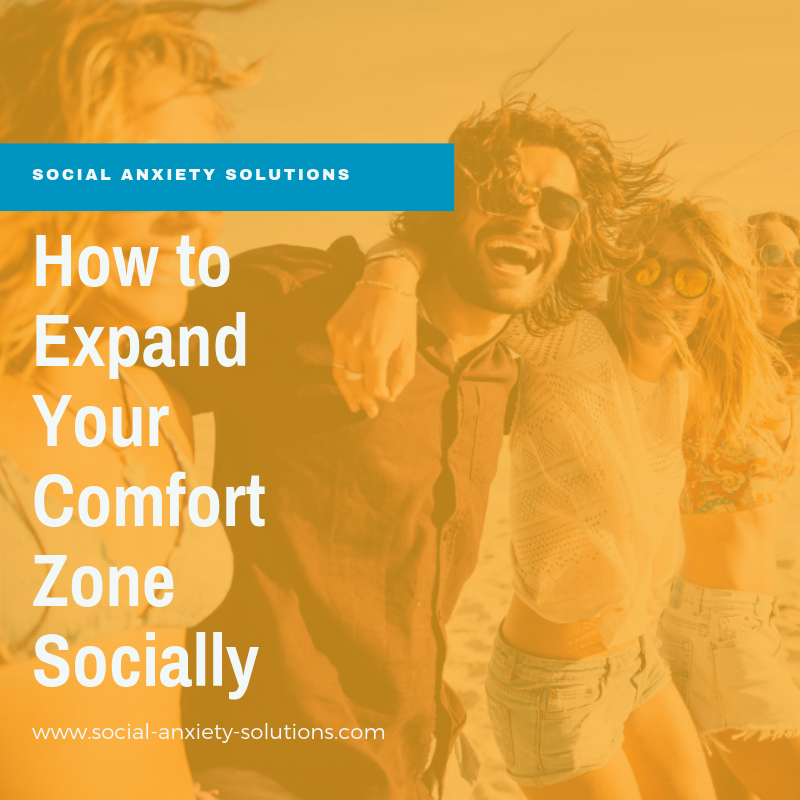 In this post, I share how to expand your comfort zone to expand your life! What would your life be like in a year if you started on this work now? Sebastiaan: Hello this is Sebastiaan from social-anxiety-solutions.com. I’m a social confidence coach and I help people to go from social anxiety to calm and relax at social situation. I do this using a different approach than the mainstream approach. I’m not all about change your thoughts and forcefully face the things that you are afraid of. Though it does have value to change your thoughts and the mindfulness techniques are somewhat helpful, they’re just far more effective approaches in order to get to a place where your anxiety free. Where there is no anxiety, where you’re actually calm and at ease, we have a good time socially. What I want to talk about today is facing your fears. What? Yes. Actually, not facing your fears but more getting outside your comfort zone because I think there’s a bit of a misinterpretation as to what people mean by it and maybe with what I mean by it. I start with a story. The end of 2018 I was like “What’s going to be my new year’s resolution for 2019?” And I’m like “It’s going to be doing more new things” because they’re a bunch of things here that I kind of have made fun of and I’m like “Yeah, that’s probably not for me, it’s not my thing and I’ve kind of postponed it”. And I’m like you know what? I’m just going to do these things this year and we’ll see what happens. Now, I don’t have social anxiety. That’s not something that’s in my life any longer, thank God. But there are still things that I prefer and think that I don’t prefer. And so, things that I don’t prefer that I’m not familiar with, you could say these are outside my comfort zone. Anything that’s new is outside your comfort zone because you’re not automatically comfortable with it. But something being outside of what you’re familiar with and going to do that makes you familiar with more things so then you grow more comfortable with a wider array of things. That’s what I mean with getting outside your comfort zone. 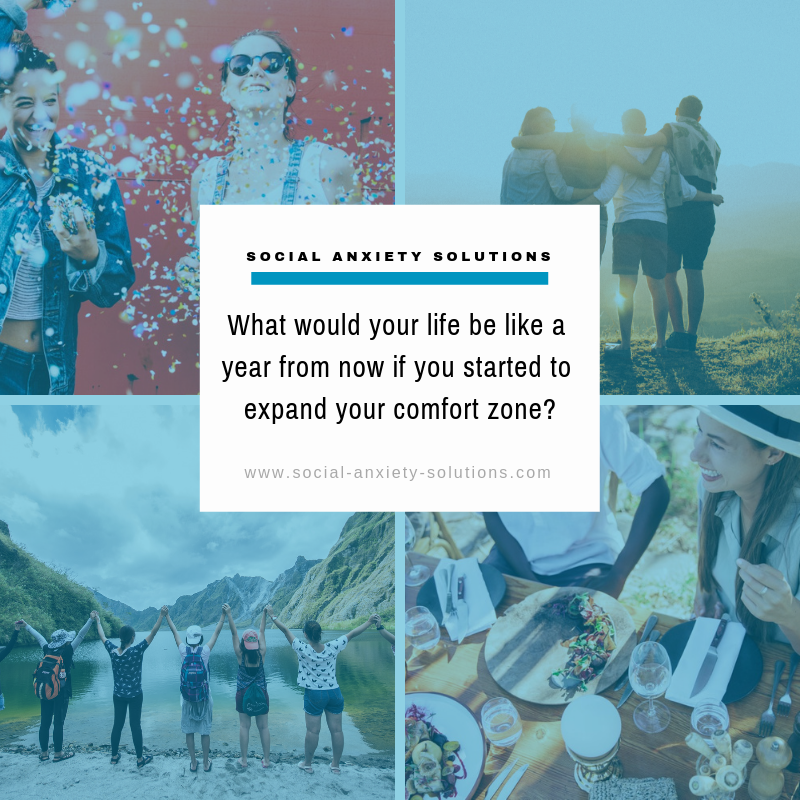 But when you’re comfortable with yourself and you’re able to connect with people and you feel you can handle anything that comes your way, it’s not that you’re facing your fears, it’s more that you’re exploring what’s outside your current comfort zone. 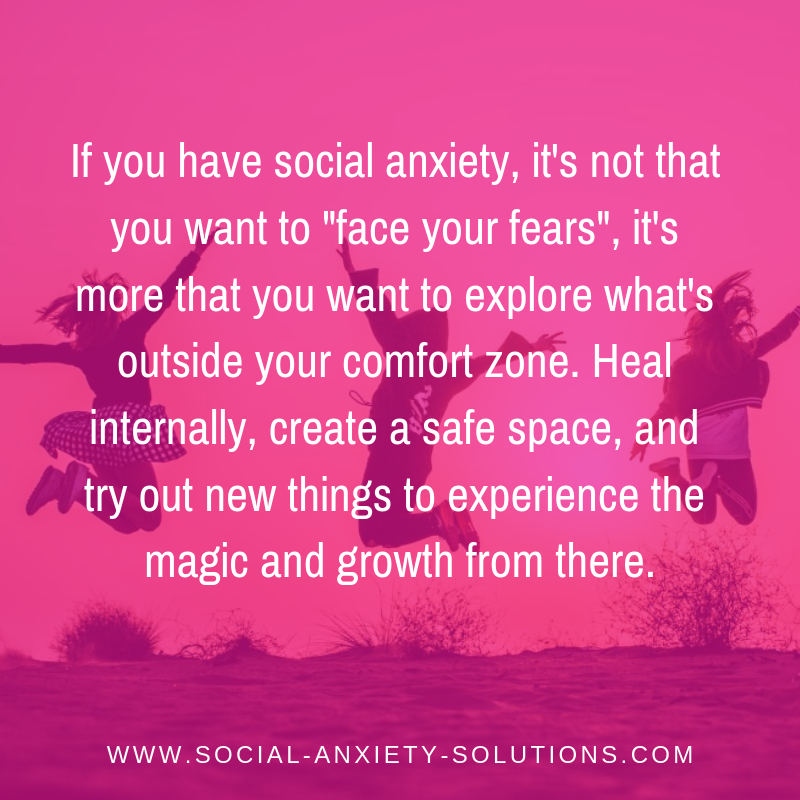 And I think that in a lot of the personal development that is outside the social anxiety realm that’s actually what they mean with the magic is outside your comfort zone. What they mean is you want to try out new things and then see what happens, see the growth that is inherent in that. One of the things that I just did yesterday was I went to an authentic relating conscious communication workshop. And I’ve been making fun of that the last year because I’m like “This super hippie stuff, that’s not really my thing”. It’s like sitting in front of each other’s like holding hands to sing “kumbaya my Lord”. That’s not really me necessarily but I want to have the experience. So, I went to the theatre thing. My friend Jade wanted to come along so I’m like great. We went there and it starts out and you sit in a circle and we were told what the “rules” were and they had a couple of funny hand gestures and then we had to walk around in the room, make eye contact with the people in the room and kind of look at each other and then whenever you feel a particular connection with a certain person that person is who you’re going to do a particular exercise with. We did and then I sat down with this girl and then we were supposed to elegize, maintain connection and she’s going to tell what she didn’t like in 2018, what she wanted to get rid of and then afterwards what she wanted to bring into her life in 2019 and all the while maintaining eye contact. She also had to express how she wanted to let go of that which wasn’t serving her anymore with her body or with sounds. Some people in the room were screaming and and then she made some weird head exercises. Anyway, like what I expected beforehand why I made fun of its kind of happened it was a bit of a fruity place a bit of a freak show, but it was actually really nice, and it was very much connecting with everyone in the room. Afterwards we all went for dinner and it was just a great time. These kinds of experiences kind of give you a broader perspective and it’s kind of updates your current perceptions about what’s going on. Because what you do want to do, this is kind of the main message of my video is you do want to try out new things, you do want to go outside of your comfort zone. However, if outside your comfort zone is alright, “I’m going to go to this new thing when I think about it it’s an 8 out of 10 strong fear”, yeah, that’s not really what I mean because then you’re likely going to have a very unpleasant experience. If that’s your experience you have a really strong fear of doing something that you want to do some inner work first to get yourself to neutralize or at least to minimize your fears so that when you’re go into it, you’re not already all shaken and protecting yourself from getting hurt and worried that you’re going to be embarrassed and those kinds of things. You first want to do some inner work some tapping, some of these were techniques but then once you’re comfortable or relatively comfortable then you want to start new things because you want to get outside your comfort zone. Especially for the people that are just sitting at home all the time that makes your world really, really small. Start doing small little things that might be like a yoga class. What you want to do is you want to pick one thing to become comfortable with. 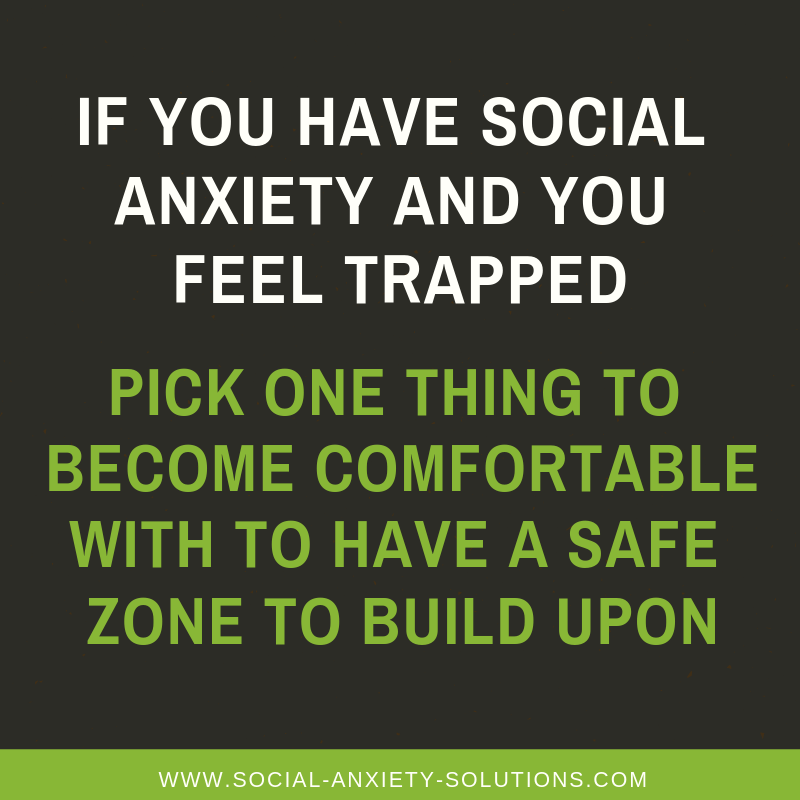 Pick one particular in your area in your life that you want to be comfortable with that if you’re comfortable there now you have a safe zone there. Let me see if I have an example of this. Maybe a couple of years ago I went to a co-working space for the first time and I was uncomfortable with that idea but I was like “Well, if I’m eventually comfortable here that’s going to open up my world in such a big way because I’m going to meet these interesting people they’re like-minded, I’ll be able to network with people, I’ll be invited to go to different places, I’ll make new friendships. So, this is a very potent area for me to be totally comfortable and at ease in. I’m going to make this an area that I focus on for a while until I’m totally at ease there”. That’s what I recommend. And then there’s just such beauty in trying out new things because you get to meet more new people and you’ll find out a lot of things about yourself. This girl what she said after eye gazing for a while, it was her turn she started out sharing and then afterwards it was my turn sharing and then after that we were talking about that was an exercise as well. We were talking about how it was for us staring into each other’s eyes and sharing these things. I was sharing that I felt quite comfortable with it, that I thought it was a bit funny when we had to physically express letting go of something and that I found myself a bit judgmental of that but other than that that it was pretty much fine. I said that I had noticed that I felt more connected to her and that I saw her as more beautiful as we were so connected, and she was sharing what she liked. Then was when she was sharing one of the first things that she said was “Oh, I felt terrified and panic at the beginning of sitting down and staring in each other’s eyes”. I’m like “Wow, that’s interesting”. And then she said as we started sharing and as we were connecting and I had shared and then you started speaking about what you wanted to let go of and you hide your stuff and you share what you wanted to attract into your life then I felt like we’re very similar, we’re very the same and that’s when I started to relax into things. Well, what an experience, right? I had no idea in the beginning that she was so freaked out. I thought she was just very focused of maintaining eye contact. Maybe I was oblivious to it because I was focusing on maintaining the eye contact as well and I was kind of observing my inner experience and trying to connect as deeply as possible. Anyway, it was very insightful for me to get her experience. It was also nice that I went there, I had particular ideas about how it was going to be. Some of them were true, others were not true, but I came out of it and I met a whole bunch of new people and I felt more connected as a result of these silly exercises, so I would have never found out about that and I would have never expanded my world if I hadn’t tried these new things. Now, this is just something for from my life right now. I’ve done many of these things. I’ve done tons of these things. I’ve lived in different countries, I have lived in different cultures, I started playing frisbee. I started dancing salsa that is also something quite recent, but I went to co-working spaces. I constantly kind of grew myself and I became more comfortable with more areas of life until it’s hard to find something that I’m not comfortable with. Where you’re not comfortable that’s where your next growth opportunity is. That’s my message of the day. Start doing new things. Look for something new that you can do, where there’s a lot of benefit for you in it once you’re comfortable with it. Now it might take you a day to get comfortable with it, might take you a month, might take you a year to become comfortable with it but have a longer-term perspective. Think about “Wow, if I keep doing in a work and after a year, I’m comfortable in this area of my life what would be the benefit of that?” Do that, all right? That would be a good one. Okay, signing off for now. I’m releasing videos like this every week. You can press somewhere to subscribe, and I’ll talk to you soon. Bye for now.